These early years are a unique time in children’s lives. Young children are discovering a world that is filled with wonder and excitement. The 2 to 3 year old stage of life is very unique. A child will grow from being a dependent toddler, to become a more independent preschooler. Our program will prepare your child with life skills by offering a variety of learning centers. The centers will challenge the total child: physically, emotionally, socially and cognitively. 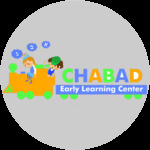 Chabad Early Learning Center recognizes that every child has unique learning styles and play interests. With this in mind, we provide a differentiated curriculum that is adapted for each child. For example, if a child expresses an interest in art, we will provide the opportunities and encourage the child to draw, paint and print. We follow an integrated curriculum, a seamless weave, combining thematic units with language, art, drama, music, math, science and Jewish holidays. Most concepts are learned as children go about their day engaged in developmentally appropriate play. As children begin a project they are encouraged to provide closure as well, which instills the pre-math concept of completion. During clean up, children are able to sort and classify as they put away materials in their assigned areas. During water play and sand play, children are exposed to weights and measurements. As children build in the block area they are exposed to spatial relationships and gravity. Your child will have wonderful opportunities to develop physically. Our programs offers enrichment opportunities along with the use of indoor and outdoor equipment.